Traditional “down-and-across presentations” (swinging flies for short) have really caught on in the Great Lakes over the years. 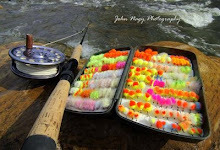 Swinging flies is most effectively done on Great Lakes tributaries that contain long/wide gravel runs and pools of relatively consistent depth. “Active” steelhead in the warm water tributary flows of the fall and spring (above 40 degrees F) are particularly susceptible to this technique. It can be performed equally well with both single-handed and spey or double-handed fly rods. The new “switch” style fly rods popular today are really small spey rods and are ideal for swinging flies on the small to medium size water of most Great Lakes tributaries. 1.) Do “read” the water before wading/casting. Look for likely steelhead holding areas (the Target Zone or TZ) that are conducive for swinging a fly through. These include the drop-off at the head of pool, current seams located in pools and runs (which steelhead like to hold along), the slow current area in a pool tail-out and the riffles below boulders. 2.) Don’t begin swing presentation without planning your wading strategy. Position yourself by wading above the TZ (easily done on many Great Lakes tributaries which are rather shallow) to allow you to effectively swing your fly “down-and-across” to steelhead. The strength of the current and depth of the river (as well as how strong of a wader you are) will determine how precisely you can position yourself above the TZ and also work your way downstream. 3.) Do control fly depth on the swing with the correct sinking system for the water flow and depth being fished. By using sink tips of different lengths and sink rates (measured in inches per second or grain weight), you can precisely control the depth of the fly. This is analogous to changing split-shot when dead-drifting. 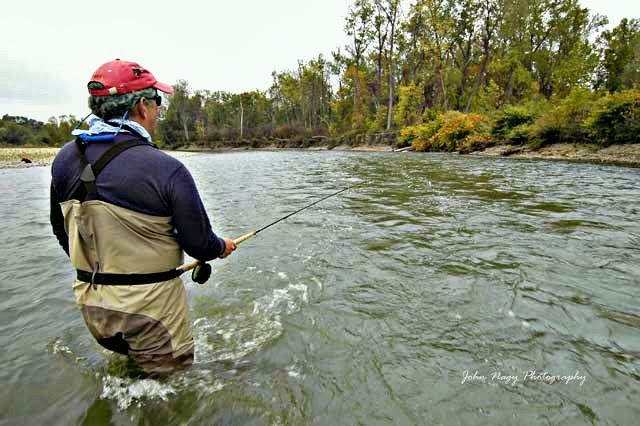 Typically you will need to go to a slower sinking tip (as you fish your way down a run or pool) since the current flow slows down as you work downstream. 4.) Don’t use heavily weighted flies when trying to get your fly deep on the swing. It is best to rely on your sinking system versus using a heavily weighted fly. Keeping the fly as light as possible will allow the fly to have a lively and natural swimming action on the swing. Flies that are too light though (like plastic tube body flies) may need some weight added to them (like a light metal conehead) for proper leader turnover. 5.) Do use your leader length (along with the sinking system) to control fly depth on the swing. Leaders in the 4 to 9 foot range will keep the fly higher up in the current flow versus a shorter leader (less than 4 feet) which is ideal for keeping the fly down close to the stream bottom when steelhead are moving less for a fly (flows colder than 40 degrees F). 6.) Don’t “over-cast” when initially working your way downstream to TZ areas. Many steelhead hold surprisingly close (literally at your feet). The prime example is at the head of a pool or run where steelhead often hold at a sharp drop-off. 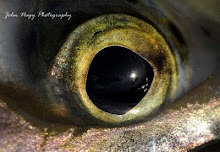 Steelhead will also hold amazingly close, especially early in the morning, on overcast days and heavily stained water. 7.) Do stand directly upstream to the area you want to swing your fly through (the TZ) and begin by casting your fly line at roughly a 45 degree angle downstream to the left or right of the TZ. 8.) Don’t fail to mend your fly line on the downstream swing. After your initial cast (as the fly line makes contact with the water), immediately throw an upstream mend in the fly line. This will help sink both the fly line and the fly more quickly. Follow up by dropping the rod tip and move it across in front of you, stopping at the point where you want the fly to swing to. 9.) Do control the “belly” that forms in the fly line as the fly swings down-and-across through the TZ below you. The size of the belly will determine the “swimming speed” of the fly as it swings across in the current. Multiple upstream mends of the fly line eliminates or reduces the fly line belly size, slows the speed of the fly and makes the fly sink deeper. By minimizing line mending you can keep the fly line belly large, causing higher fly speeds on the swing but with higher fly position in the water column. Sometimes downstream mends (and line stripping) are necessary to help swing flies through slack water areas at the end of pools and runs. 10.) Don’t recognize that the majority of steelhead will take the fly as the fly line straightens out at the end of the swing; chasing the fly across the current and hitting it from the rear as it stops. It is important to anticipate the strike at that point. Also, at the end of the swing (if there has been no strike), hold the fly directly downstream of you momentarily and then follow-up with a strip retrieve. This can induce takes especially with large streamer, leech and wooly bugger type patterns which provide a lot of movement in the current flow. 11.) (Bonus Tip) Do be patient when a steelhead takes a fly on the swing. Simply raise the rod up, and to the side, and the steelhead will essentially hook himself. Try to make this hook-set at a slow to moderate speed to avoid pulling the fly out of the steelhead’s mouth (remember, the steelhead is directly downstream of you). Steelhead takes when swinging flies are shear predatorial in nature and vary from a hard tug on your line to a veritable explosion, especially in the warm tributary run-off of fall and spring. More detailed information on swinging flies for steelhead can be found in John Nagy's classic book "Steelhead Guide, Fly Fishing Techniques and Strategies for Lake Erie Steelhead." 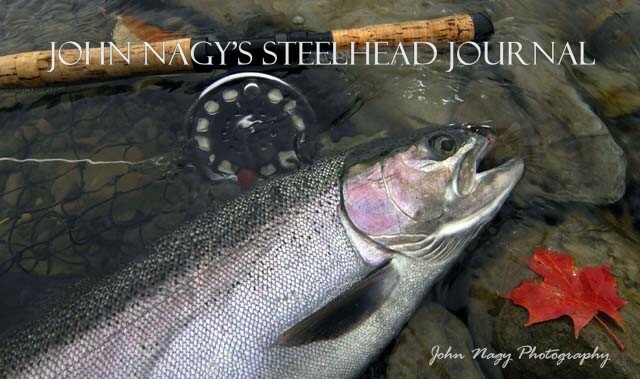 John Nagy's new book the "Steelheader's Journal" makes a great companion book to the Steelhead Guide for steelheader's looking to keep track of their steelhead trips on the steelhead tributaries. Please go to sidebar for ordering information for these books.